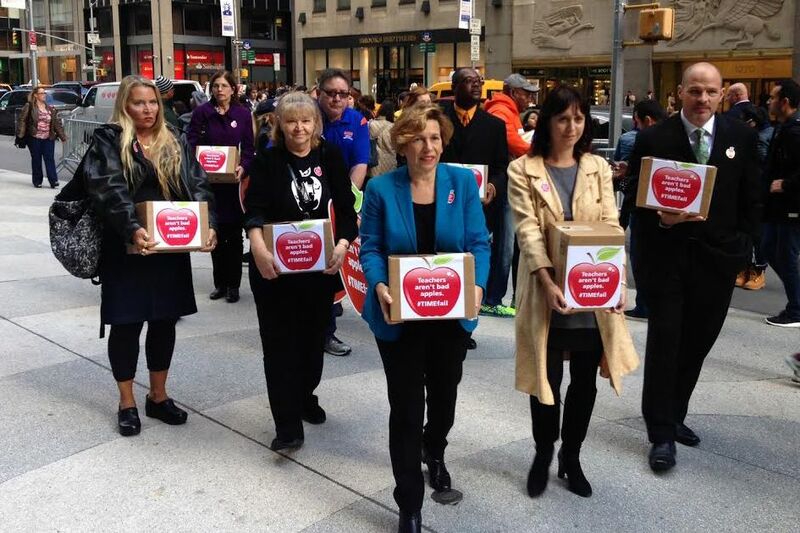 2/9/15 My Huffington Post Blogpost: When Teachers Are Pushed to the Wall: A Ray of Sunlight. Why teachers, parents, students and just plain patriots, as well as union leaders, should be on the offensive: playing defense has gotten us nowhere in the last thirteen years. Into the streets! 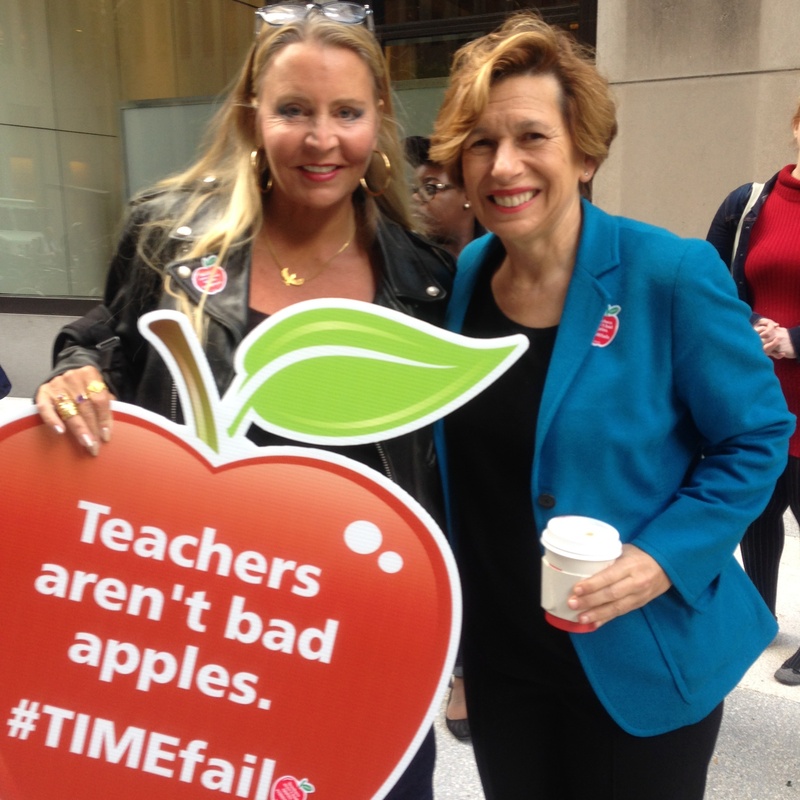 10/30/14 ACTION: Protest against Time Magazine’s outrageously unfair cover story attacking teachers, Time-Life Building, Manhattan. 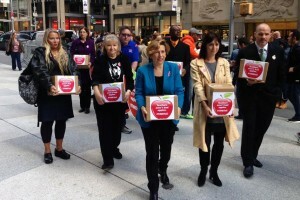 Teacher union presidents Randi Weingarten and Michael Mulgrew, parents, and teachers spoke, and petitions with over 100,000 signatures were delivered to Time directors. 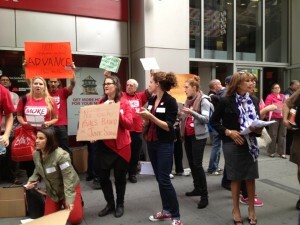 Delivering boxes of signed petitions from over 100,000 teachers protesting Time magazine. 10/26/14 EVENT: Launch party for the book Badass Teachers Unite by Dr. Mark Naison, Brooklyn. 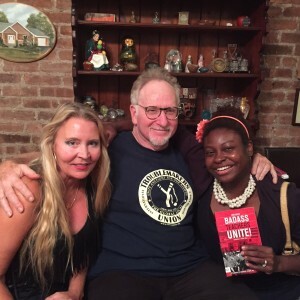 Just love fellow education activists Mark Naison and Ebony Murphy-Root! Here’s to the book getting some badass sales! 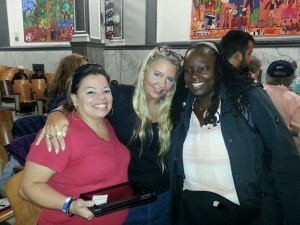 10/11/14 EVENT: Network For Public Education sponsors the First Annual Public Education Nation, Brooklyn. 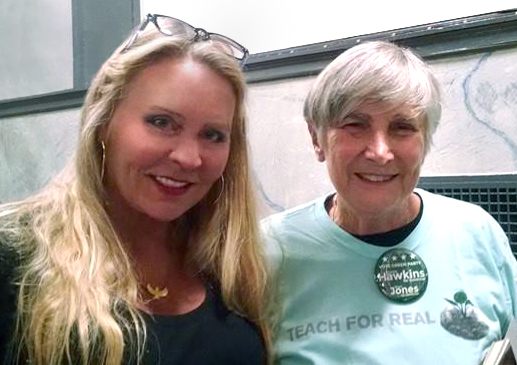 Education warriors of all stripes participated in riveting panels and speeches, enlightening and enraging a packed auditorium at a Henry Street elementary school. Lovely to be in the company of the brilliant and inspiring doyenne of the movement to save public education, Diane Ravitch! 9/21/14 EVENT: The Brooklyn Book Festival. I enjoyed signing books, meeting fans and fanning the flames of outrage at this annual gathering of authors and readers at Borough Hall. 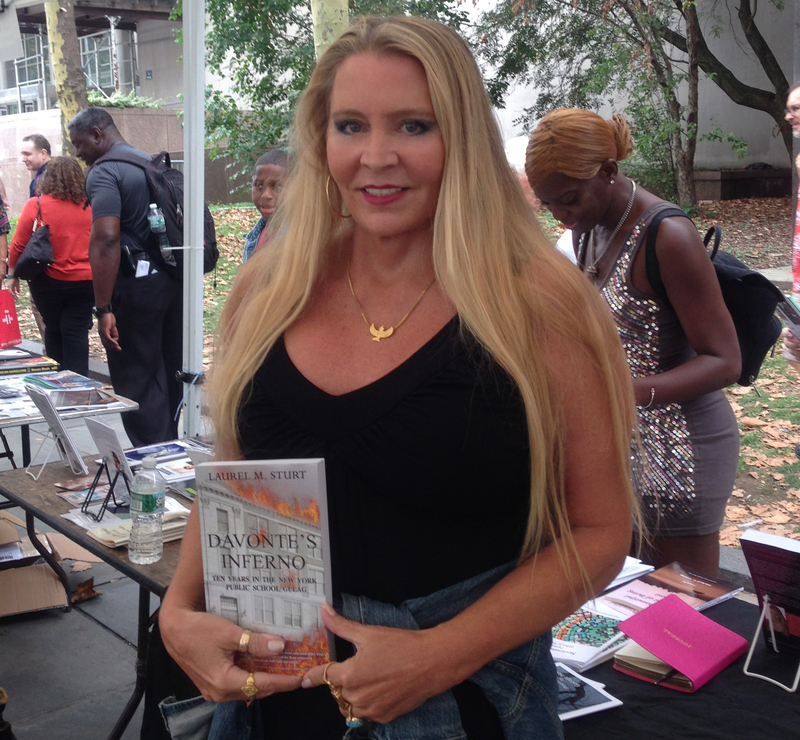 8/25/14 Book review by Norm Scott of EDNOTES ONLINE: Laurel Sturt’s Davonte’s Inferno Blows the Lid Off of Ed Deform. 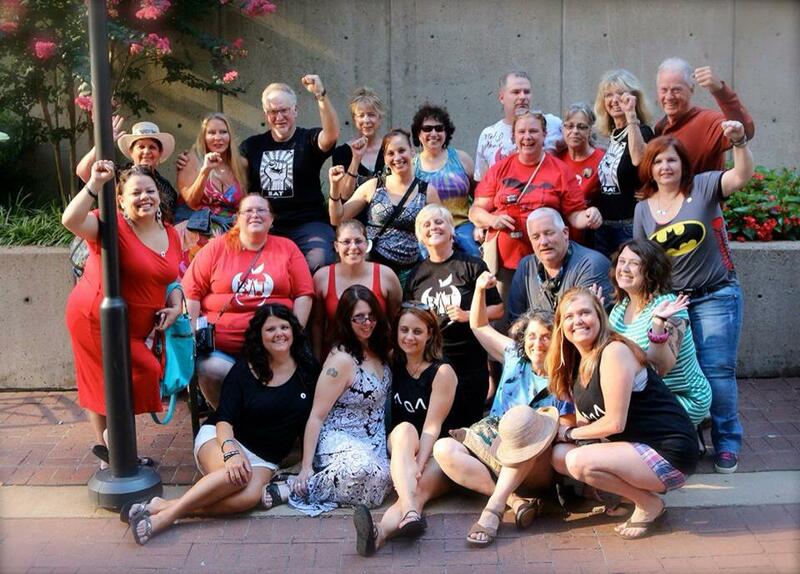 7/28/14 EVENT: The long weekend Badass Teachers Association March on the Federal Department of Education, Washington, DC, was a celebration, lovefest, outragefest and inspirationfest of likeminded education activists fed up with the theft of public education. 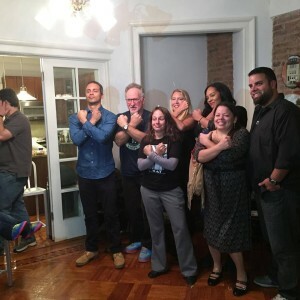 We found out we don’t just love to agitate, we LOVE to DANCE (especially to funk music)! So many highlights were capped off when BAT leaders met with Secretary of Education Arne Duncan and other feds to deliver a much-needed does of reality–and indignation. BAT mods fighting the power! 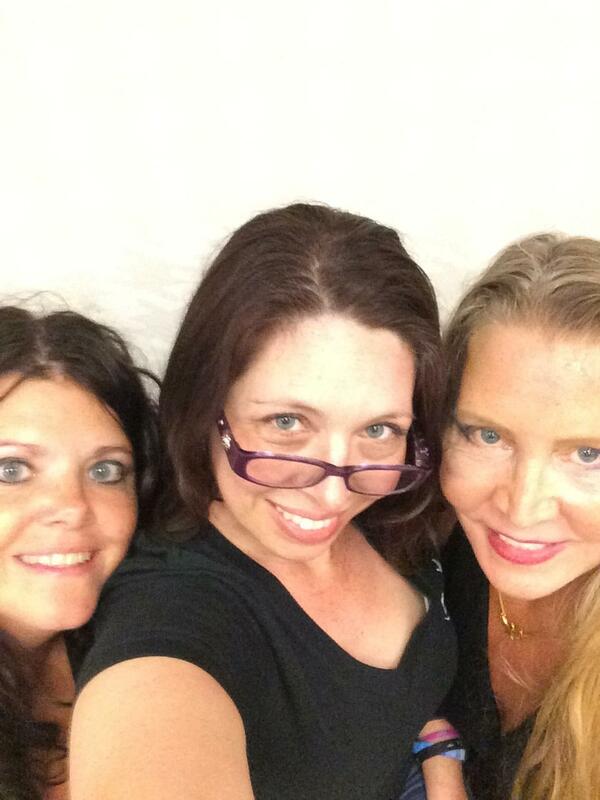 Lovely to meet Southern Belle BATs Lucianna and Lee-Ann. 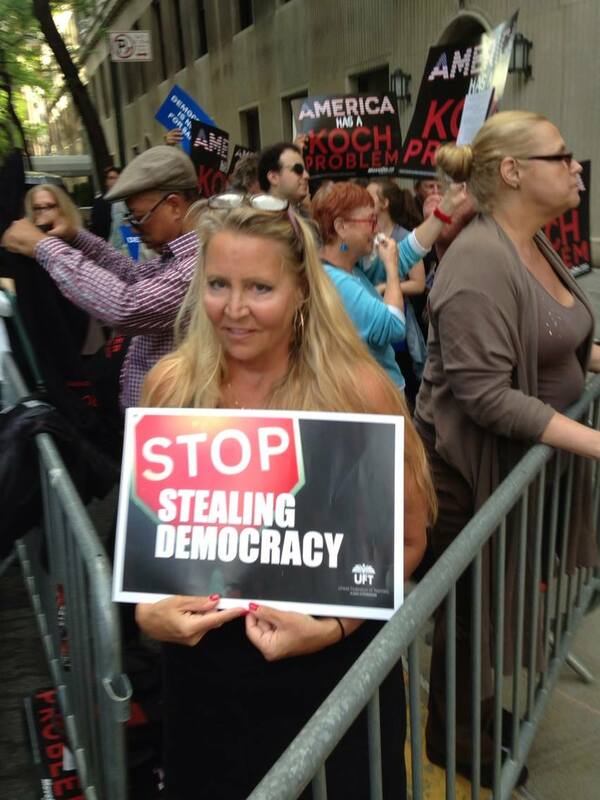 6/5/14 EVENT: America Has A Koch Problem – Rally Against the Koch Brothers, 740 Park Avenue, Manhattan. 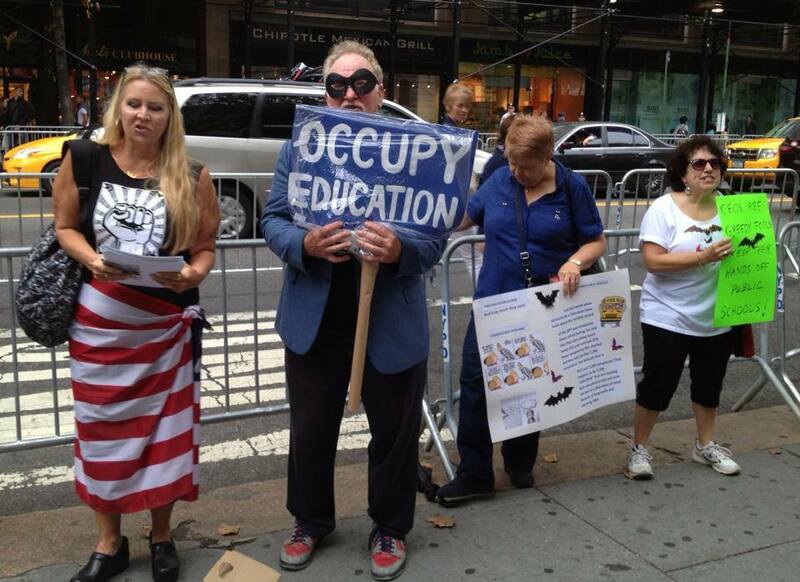 5/17/14 EVENT: Rally to Take Back Public Education, City Hall, Manhattan. 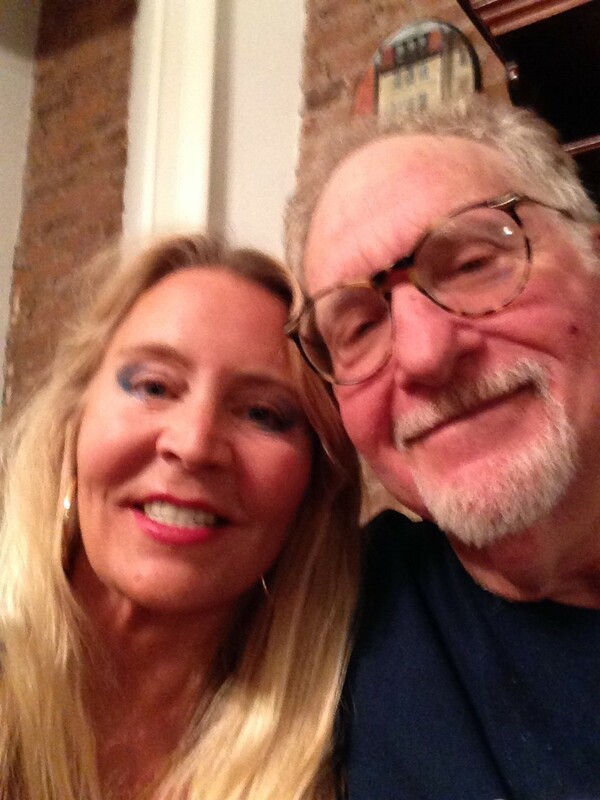 5/14/14 EVENT: Book reading, discussion and signing at the Nuyorican Poets Cafe, 236 East Third Street, Manhattan, 6:30 – 8:30 PM. Proceeds benefit the MORE Caucus of the UFT. 4/19/14 EVENT: Guest speaker at Hartford: The Fight for Public Education, sponsored by Hartford Socialist Action, Hartford Public Library, 500 Main Street, Hartford, CT. 1:30 – 3:30 PM. DAVONTE’S INFERNO’S NEW HOME AT BLUESTOCKINGS, AMONG BOOKS SEEKING TO CHANGE THE WORLD, ONE READER AT A TIME. 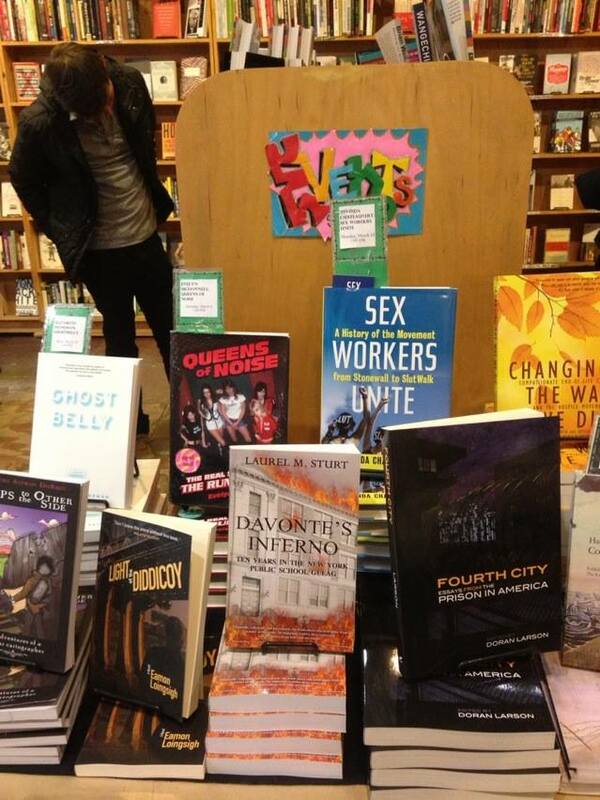 3/7/14 EVENT: BLUESTOCKINGS BOOK STORE ON MANHATTAN’S LOWER EAST SIDE FOR A READING, DISCUSSION AND BOOK SIGNING. 172 ALLEN STREET, MANHATTAN. 1/30/14 Anthony Cody from Living in Dialogue in Education Week TEACHER, excerpts my book, a scene that will live in infamy for, at least, the rest of MY life. 1/10/14 My article in Huffington Post excoriates Gov. Cuomo, Ed. Commissioner King and Chancellor Tisch, along with the pretentious destruction they’re serving up as education to the children of New York state. 1/6/14 ACTION: Protested Gov. 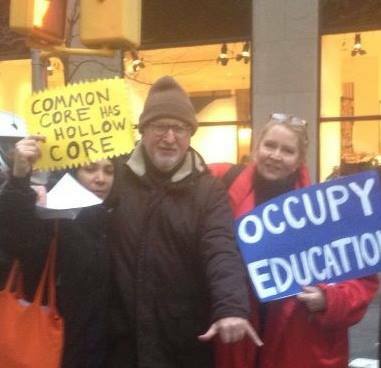 Andrew Cuomo’s perpetuation of the Common Core with Diana Zavala of Change the Stakes and Mark Naison Of Badass Teachers Association. 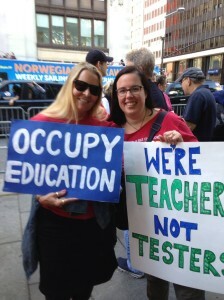 I repped BATs and the MORE Caucus of the UFT! “My name is Laurel M. Sturt. 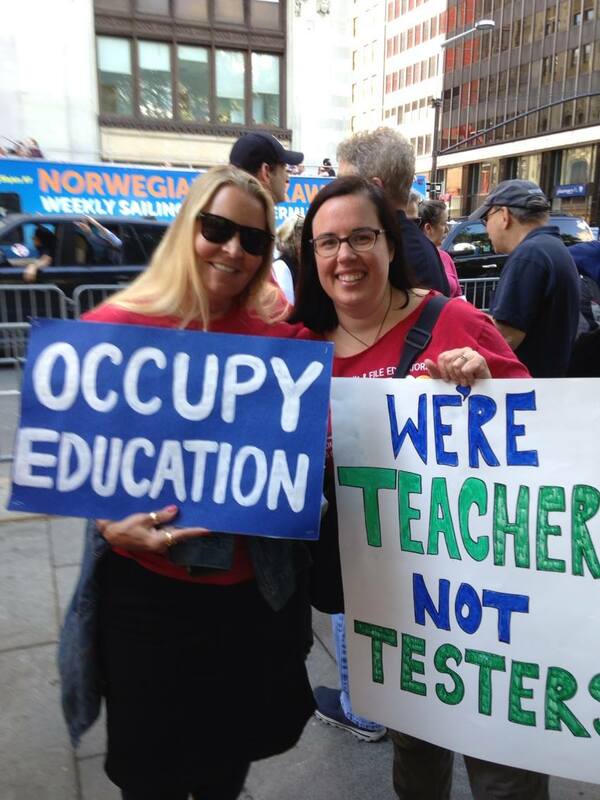 I am a retired New York City teacher, a proud member of the MORE Caucus for social justice of the UFT, and a Badass Teacher from the Badass Teacher Association, one of 35,000 of us. We’re mad as hell and we’re not going to take it anymore! Start at 18:30. Pardon my change of “thirteen” million for the correct “thirty,” and “Hechinger” for “Heckman:” it was only my second interview ever and man, was I nervous! 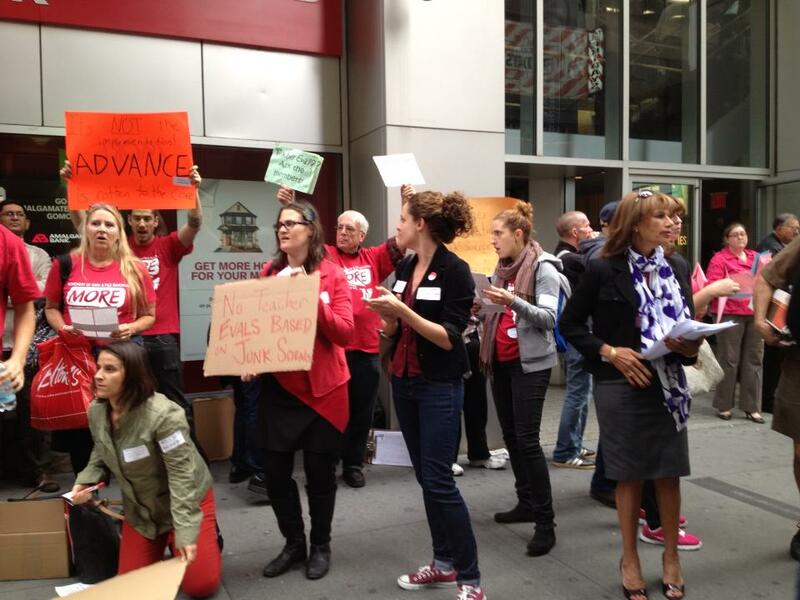 10/9/13 ACTION: “WIN BACK WEDNESDAY” PROTEST AGAINST ILLEGAL TEACHER EVALUATIONS IN NEW YORK STATE. BROADWAY (WALL STREET, 4 TRAIN) UFT HEADQUARTERS, SPONSORED BY MORE CAUCUS (MOVEMENT OF RANK AND FILE EDUCATORS). WEAR RED. 4:00 – 6:00 PM. Looks like the “reform” movement is leaving a bad taste in my mouth! 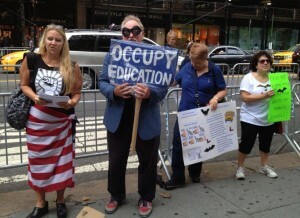 10/6/13 ACTION: OUR PROTEST OF NBC’S “EDUCATION NATION,” “MISEDUCATION NATION.” OUTSIDE THE NEW YORK PUBLIC LIBRARY, 42nd STREET AND FIFTH AVENUE, MANHATTAN.